Heat oven to 400°F. In medium saucepan, cook potato slices in boiling salted water over medium-high heat for 5 minutes. Drain. Fry bacon in large skillet over medium-low heat until crisp. Drain on paper towels. Crumble bacon; set aside. In same skillet with bacon drippings, cook onion 5 to 7 minutes or until softened and separated into rings, stirring frequently. Separate dough into 10 biscuits. Separate each biscuit into 2 layers; place biscuit rounds on ungreased large cookie sheet. Flatten each slightly. Spread each lightly with mustard. Top each dough round with potato slice and onion. Bake at 400°F for 9 to 15 minutes or until crusts are crisp and golden brown. 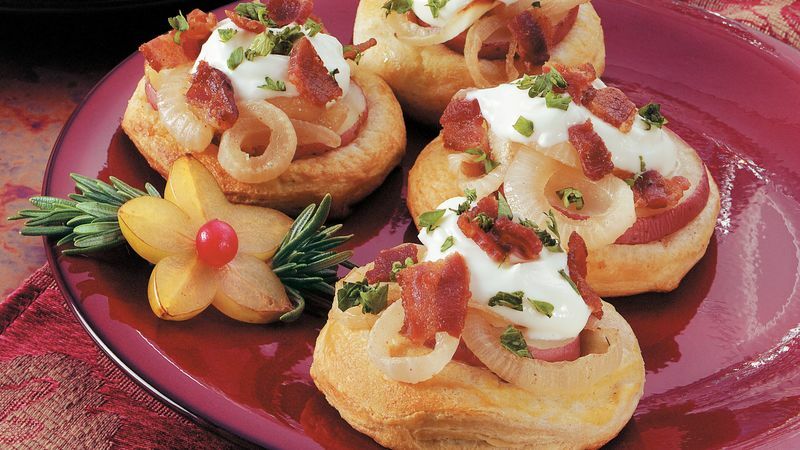 Top each mini pizza with sour cream and crumbled bacon. Sprinkle with parsley. Use red boiling potatoes - not bakers - for these mini pizzas. Boiling potatoes contain less starch than baking potatoes, and thus hold their shape after cooking. Try your favorite mustard on these mini pizzas; for kids, use the yellow mustard they know. For Potato and Bacon Pizza, use Pillsbury™ Refrigerated Pizza Crust and follow the package directions for a single, main-dish pie.